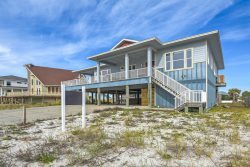 Gulf Coast Getaways is pleased to offer one of Pensacola Beach’s newest and most luxurious gulf front townhome properties, a real dream! You will enjoy amazing views of our sandy white beaches and pristine gulf waters. Please read through the incredible features of this unique upscale property. *4 bedroom, 3 bath with outdoor shower. 3000 Sq. feet with 4 outdoor balconies and 6 car garage. Incredible bed layout with king Bed in Master along with queen sleeper sofa (huge space), 2 queen beds in one upstairs bedroom, single queen in 3rd upstairs bedroom, and 4th bedroom downstairs like a second master suite with king bed and attached bathroom. * Gated security entrance to the complex with 2 pools. Door front beach access with handicap dunes crossover bridge. *Expansive gourmet Viking stainless steel kitchen with prep island allows 6 chefs to comfortably prepare the Gulf's best cuisine. The outdoor stainless Napoleon grill complements the suite which includes 2 refrigerators, beverage center, ice machine, convection microwave, convection double oven, natural gas cooktop and warming drawer. *State of the art Dimplex Prism electric fireplace sets the mood for the evening with 1 touch ease. 12 color spectrums to choose from. *State of the art Sonos house sound system. Play your phone/tablet/internet music feed throughout the home, including the oceanfront decks and steam room! *Aquaterra 6 person outdoor hot tub overlooks the Gulf of Mexico on the master balcony. 4 Nardi Omega Italian lounge chairs accommodate private tanning and oceanfront relaxation. Every bedroom has a large outdoor water view deck. *6 Hi Definition Smart (internet) 65-70 “ TV’s with Bluetooth sound bars for days when the weather rolls in. 1 button access to Netflix/Hulu/Amazon accounts and more. *Ultimate Master Bath Spa includes Kohler free standing soaking tub, 40” television, heated porcelain floor and walk in cedar closet. 2 person Steam spa with aroma therapy, chromotherapy (lighting) and Sonos sound system. A Beautyrest BLACK mattress completes the Master Bedroom upgrades. *4 person elevator makes move in day seem effortless. *Laundry mud room seating gets the kids from the beach to the shower with an organized space for flip flops, suits and towels. *Rinnai endless hot water system and geo thermal A/C adds thoughtful environmental efficiency. Rest assured as dolphins patrol the shoreline, we have put your comfort as our highest priority in our newest, most luxurious property. This is one of a kind gulf front experience! Book now for spring and summer of 2018. Our place was gorgeous and so roomy!The pictures were just what we walked in to. I didnt really work with anyone, but they were very responsive when I asked questions via text. Even with a tropical storm in the Gulf, this was our best beach trip. This beautiful home filled all our needs and was the perfect place to relax and unwind. It was fantastic. The best vacation rental we have ever stayed in. The only thing I would change is to get some window coverings in the master BR. I loved the open view, but it could have used a power shade or something that can drop at night and in the mornings. It gets really bright early. Everything about the property was great. The kitchen was perfect, 2 refrigerators, full size washer and dryer, grill, hot tub, awesome showers, etc. It had all our needs and wants covered. The management group that handled this was very very responsive to any questions that we would have .